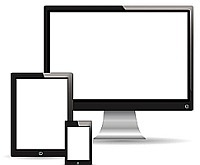 responsive website design so that potential clients and customers can access information about your business equally well on widescreen desktop or laptop computers or the smaller screens of tablets and smart phones. search engine optimization and, more importantly today, local search optimization. ongoing site management and maintenance to ensure that your business website is up to date with respect to content and with respect to keeping pace with and promptly repairing security vulnerabilities as they become known and exploited. technical support and hosting or recommendations for hosting depending on the nature of your business and the type of internet presence you desire for your business.